Keloids are exaggerated scars that expand outside of the area of trauma, injury, or surgical scar. Scars are a natural part of the healing process. Keloid scars are an exaggeration of that normal healing response. These scars may form in response to trauma (burns, piercings or acne), injury, or surgical scars. Keloids look like large red/purple, solid nodules. They may also be itchy or tender. The likelihood of developing keloids is genetically determined- in predisposed people, keloids occur even with the most careful wound care. Keloids occur more commonly in African Americans. Keep in mind that keloids are stubborn scars that tend to come back after treatment. The earlier a keloid scar is treated, the higher the chance it will respond to therapy! The therapy of choice is commonly an injection of a corticosteroid into the scar. The corticosteroid prevents abnormal proliferation of the cells that form the scar. These steroid injections can make the flattened keloid appear better and less noticeable, but will feel different than the surrounding skin. Pulse dye laser therapy is another option. The laser causes the keloid scar to get smaller by stopping the cells from multiplying. Combining laser treatment with corticosteroid injection is more effective than just laser therapy alone. Surgical excision (removal) is another choice, and is also best followed by injection of a corticosteroid. 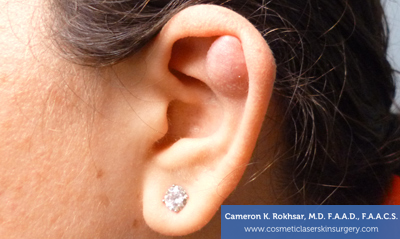 Be sure to tell Dr. Rokhsar about the injury that caused the keloid and when you noticed it. In order to determine the best therapy, also tell the doctor if you have ever had any keloids treated in the past, either successfully or unsuccessfully. Earlobe keloids appear as smooth, globular growths on one or both sides of the earlobe and may or may not be painful. They range in color from pink to red and may develop from an injury or wound site and can migrate into surrounding areas. Type of treatment depends on the location, size, depth and duration of the earlobe keloid. The reason some people are more susceptible to keloid formation is currently unknown, but do occur more commonly in people with darker skin, those with body piercings, and the elderly more than children. Keloids develop most often on the chest, back shoulders and earlobes. Removing a keloid depends on the symptoms that accompany its appearance. A chronically itchy or irritating keloid can pose problems and depending on location, can be cosmetically sensitive or embarrassing and even lead to disfigurement. A cortisone injection is a type of steroid, almost identical to the cortisone produced within the body. It is a steroid used to reduce inflammation and when treating keloids, flattens them but doesn’t completely rid the body of the keloid. Dr. Rokhsar could use an intense pulsed-dye laser (IPL) because of its effectiveness at flattening keloids and making them look less red. This treatment is relatively painless because it uses specific wavelengths to target the vessels or pigment responsible for the keloid appearance. The procedure last for up to 30 minutes and could require two to five treatments in order to obtain desired results. Surgery is an option for removing a keloid by first injecting it with steroids to decrease its appearance and then once removed pressure is applied and the wound is dressed. This is risky because cutting a keloid can trigger the formation of a similar or even larger keloid post surgery. Cryotherapy, which is the freezing of affected cells in order to destroy them, can be used, however, freezing keloids with liquid nitrogen may only flatten them and darken the site after treatment. Interferon, a topical treatment; fluorouracil, a chemotherapy treatment; or radiation are also treatment options used to reduce or eliminate keloids. Treatment depends on your case of severity, location, depth and duration and if they develop, you should consult with your doctor.